If you have a any sort of pests in your environment there are several methods to get rid of them. There are chemical alternatives and non-chemical alternatives. If you decided to use the non-chemical alternative to control pests from growing, heat might be the best method to get rid of pests. Non-chemical treatments are generally effective for longer periods because they pose no health hazard to humans and to the environment that is being affected. If you are choosing the non-chemical method and using heat to kill bed bugs, the process will not kill the bed bug itself but also the eggs. That is an advantage when using the heat method. Other chemicals will only treat a section where an environment is being affected but it will not treat an entire structure. 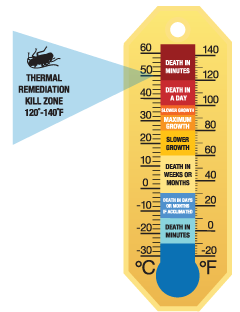 Raising the temperature in a place for several hours will generally eliminate a bed bug infestation. The heat process better known as ThermaPureHeat has been known to be very effective. According to thermapure.com, "68% of all bed bug infestations require three or more treatments, 26% require two treatments, and just 6% require one treatment." If you are sensitive to chemicals or simply do not want to use any chemicals when treating pests, the heat process is the best alternative to control and get rid of pests in your environment. Alliance Environmental technicians are highly-trained in using heat treatment for pest control.If you need pest control assistance, you may contact your local Alliance Environmental office and we will answer any concern you may have.